Tonight, despite the leftovers begging to be released from their (glass, because when my mom found out about BPA, you can guess what was under the Christmas tree) Tupperware containers, I decided to forge ahead with a plan for lentil soup. It’s freezing and windy and tomorrow it might even snow here (let’s keep our fingers crossed!!). 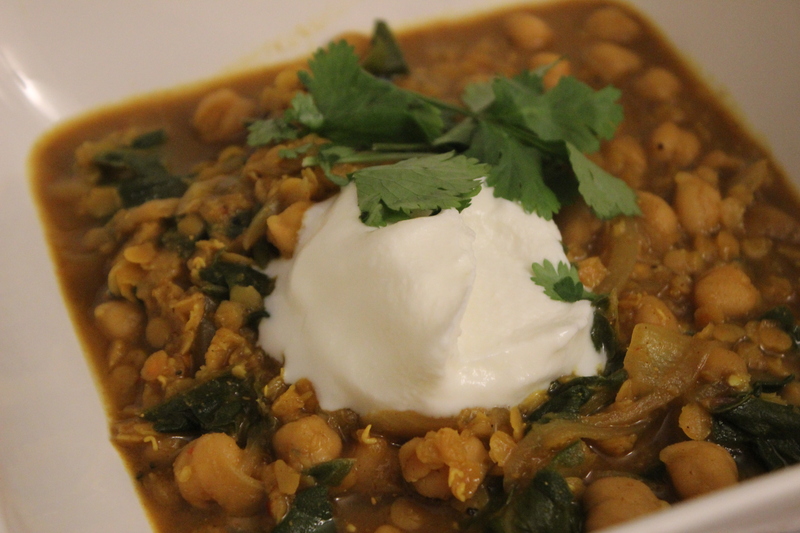 You may recall lentil soup with Swiss chard is a staple around here…but I recently bought some garam masala and why not? 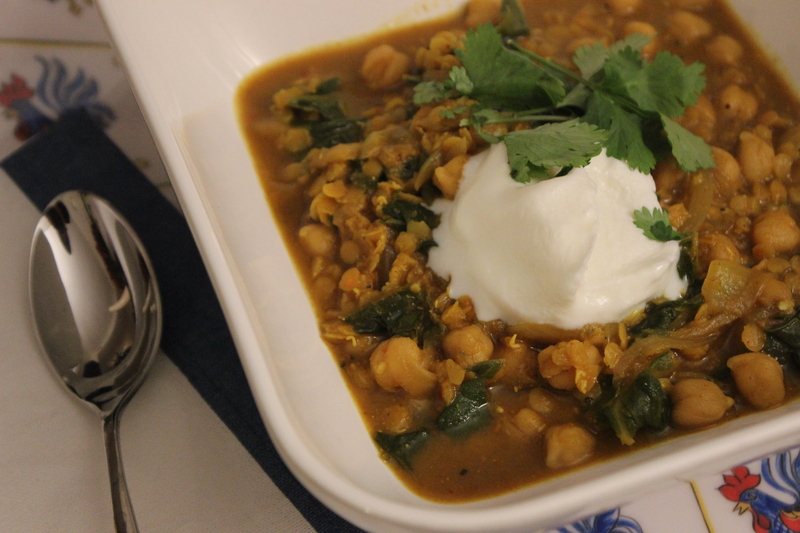 Enter Bon Appetit’s plan to integrate curry and garbanzo beans + a few small tweaks, because I just can’t help myself, especially around garlic. back to our cilantro ways! If serving with rice (in the Husband’s view, you can’t over-carb), get your water boiling – the rice will take about the same time as the soup, if you get it going first (especially if using jasmine rice). Cook rice according to directions and keep warm. In a large saucepan, heat the olive oil. Cook the onions down, until translucent, over medium-high heat. Add garlic and cook for a minute; add the curry powder, cayenne pepper, crushed reds, and garam masala. Mix well and then add broth and Swiss chard; bring to a boil. Add the lentils and reduce the heat. Split lentils will take significantly less time to cook than non-split ones; if working with split lentils, add the chickpeas now. If not, let the lentils cook down a bit before adding the chickpeas. Cover the pot and simmer until the lentils are tender – about 10 to 20 minutes. Taste your soup & adjust accordingly. Mine was quite bitter and a bit heavy on the seasonings. To counteract this, I added (very small & equal) amounts of salt and sugar and stirred until dissolved, until I was able to bring the bite down a bit. Before serving, add the lime juice and stir. Serve with brown rice, topped with a bit of plain Greek yogurt and cilantro. TIP: Mixing the yogurt all the way through will also serve to counteract any lingering bitterness and really bring all of the flavors together, though obviously, this won’t work for the lactose-intolerant. Around step 4, I got really worried. In the Husband’s words, it tasted “not bad…like water, with seasonings.” However, I’m starting to trust myself a bit more, and rather than resign myself to bad soup (which I have definitely foisted upon the Husband before – cue the burned-pumpkin-soup story from our days of pre-dating, which he ate up with a big, if forced, smile. ), I actually fixed it, with salt, sugar, and a bit more time stewing. This turned out deliciously – warm, tasty, and filling (another) happy Tupperware container to bring for lunch. Topped with avocado, next time!